Cut a length of denim hem from a recycled pair of jeans and trim it close to the hem line. 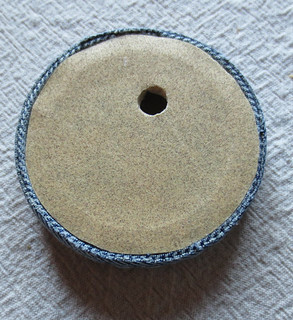 To get the correct length of denim, put it around the jar lid before gluing it down. Once you have the length, trim it so it just touches the other end. 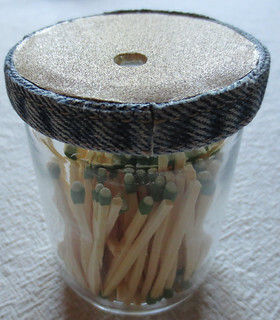 Glue the denim around the edge of the jar lid and let dry for several hours. 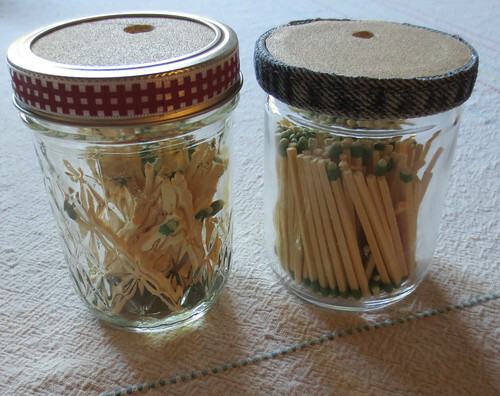 Here are the two different recycled glass jars I used for the match holders. 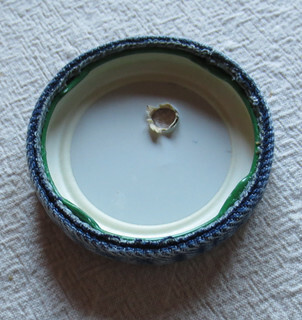 If you use a jar lid such as on the jelly jar then you don’t need to glue the sandpaper on the lid top. I just used a piece of cardboard under the sandpaper to support the lid top. Poke a hole through the top so you can shake out a match as needed. I just love these match holders. They work great for storing stick matches next to my woodstove. I can just shake out a match through the hole and strike it on the sandpaper to light the matches. Having the sandpaper is handy if you don’t have the strike anywhere stick matches. 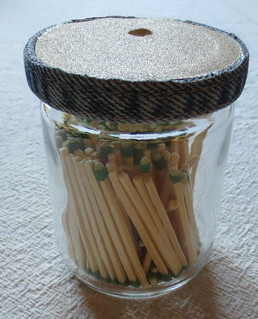 So grab an old jar and a strip of recycled denim and make yourself one of these handy wooden match holders. You can decorate them in many different ways to create a cool-looking and very useful match holder. This is a really cool and neat idea. How long would you say it takes to make one of these? incredible idea of making something creative out of the waste. I’ll definitely try this. I love recycled material art. Congratulation for the blog site and the pictures also.